My career has taken me to some interesting and some not-so-interesting places. Fortunately, I carry a camera with me to record it all for posterity. Lately it feels like I spend more time traveling than I do at home. But I'm sure that's just my imagination running away with me. It tends to do that. I've also collected some favorite pictures and cropped and scaled them for use as desktop backgrounds. If you have a widescreen PowerBook like mine, you might enjoy them. (By the way, does anybody remember the ITV series that gave these pages their name? No? My first major business trip coincided with a transfer from Upstate New York to Southern California when I was all of twenty-five. I was fighting for more money. My new manager offered me two months in London. I accepted. Eight and a half months later I finally made it to California. Below are some images from that trip and the much shorter ones I've made since. I always imagined London as described by Conan Doyle and portrayed by Basil Rathbone: a place of cutpurses and ruffians whose activities were held in check by well-meaning but often inept officials with the help of the odd talented amateur. Scotland Yard, home to Inspector Lestrade and his ilk, was a landmark I knew as well as Big Ben. 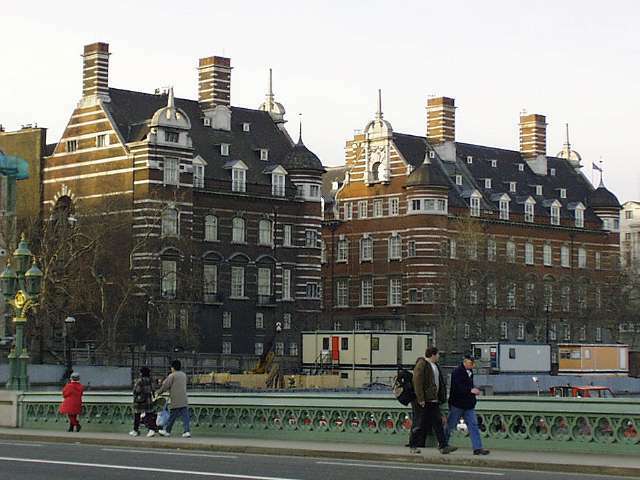 Actually, this is New Scotland Yard. The original Scotland Yard is a couple of streets away and got its name from the fact that a road called Great Scotland Yard is at its rear. That building was just reopened as stables for the Metropolitan Police. 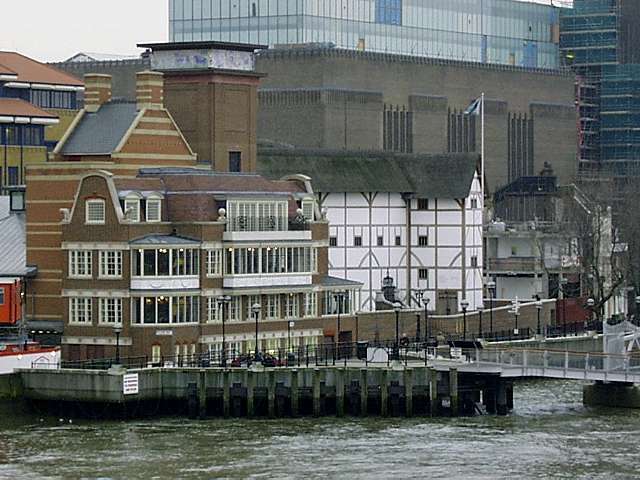 And New Scotland Yard? It's been replaced with a boring chrome and glass structure near Victoria Station. It too is called New Scotland Yard, although it's a lot newer than this New Scotland Yard. Do they do this just to confuse us tourists? A couple of views of the clock that adorns the Houses of Parliament. We all think of it Big Ben, although a purist will point out that that's the name of the clock's bells and not the clock itself. When I first saw the tower I was a little disappointed; somehow I expected it to be a lot bigger than it is. In the second volume of Following The Equator, Mark Twain talks about this phenomenon: how your own image of great landmarks is far greater than reality but how the two come together again after repeated visits. 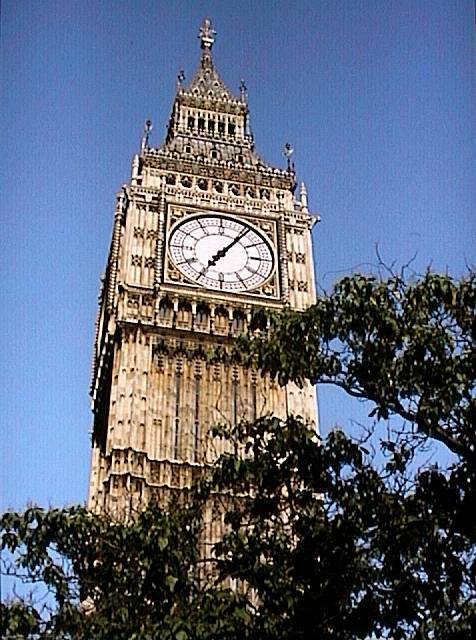 And so it is with Big Ben; after almost twenty years I can't imagine how I wasn't impressed. Smart man, Twain. 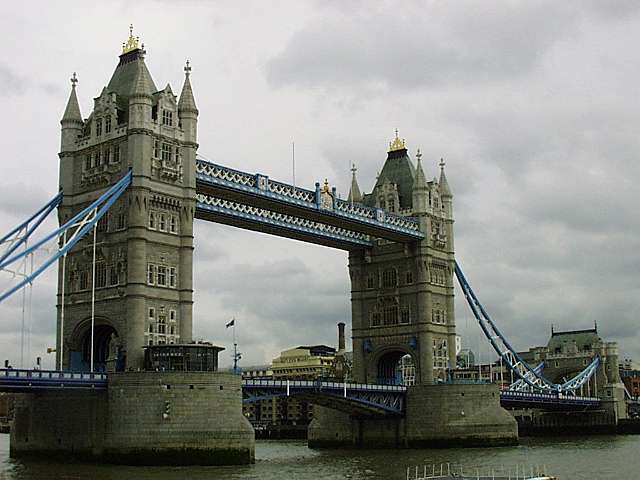 Tower Bridge is the easternmost and by far the most interesting looking of the many bridges across the Thames. I was surprised to learn that it isn't all that old, dating back only a hundred years or so. Its design is entirely practical: the drawbridge permits ships access to the docks to the west while providing a street level roadbed for the era's horsedrawn traffic. A remarkable achievement of Victorian technology and sensibilities. 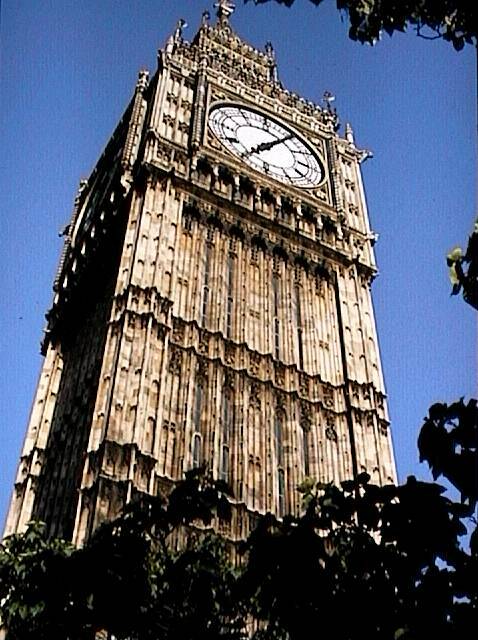 By the way, notice the difference in the sky color from the Big Ben pictures above. Now this is London weather the way I remember it! 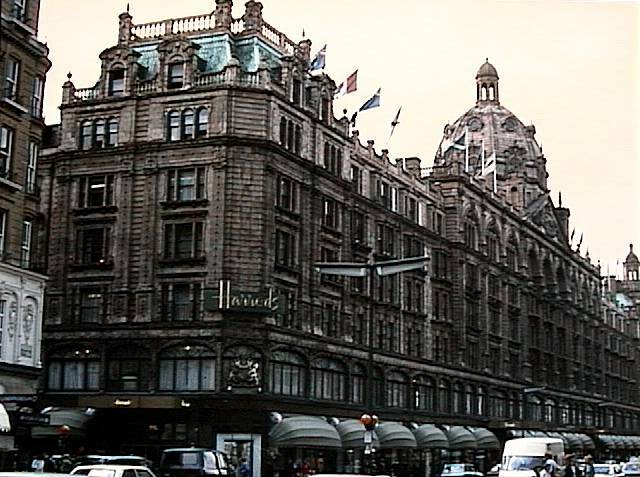 On every trip I try to stop at Harrods and visit my money. Harrods food halls are spectacular, although less impressive if you've been in a Japanese department store. Still, their collections of glass and china are unmatched. And they still deliver: a friend arranged for them to deliver a copy of the Hitchhiker's Guide To The Galaxy on record (this was a while ago) for a party. They couldn't find the address the first time and we couldn't wait for their next delivery day, so they sent someone out on the Underground to complete the delivery. Extra points for service, guys. 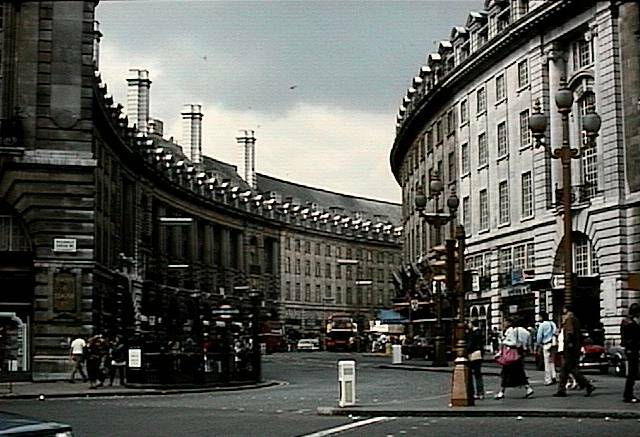 A view of Upper Regent Street from Piccadilly Circus. Regent Street is home to some of some of my other shopping haunts, including Liberty (source of cool ties and great windows at Christmas) and Hamley's, the world's biggest toy store and the usual collection of American stores. There's even a Warner Brothers store there now. But, sadly, they don't offer any special British cartoon stuff. 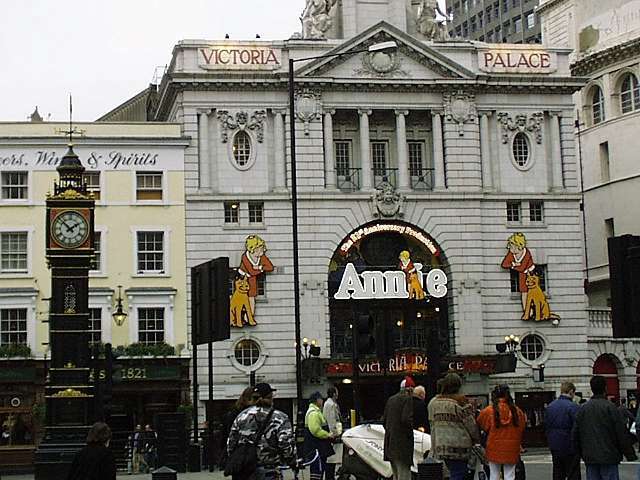 London is where I first developed my passion for theatre, taking in a musical or a comedy or a thriller nearly every weekend during that first long stay. (Now when I visit I try to see something nearly every night!) Annie was in its first run during that long ago time. And what a pleasant surprise to reencounter it almost twenty years later. A couple of small changes, though. For one thing the youngest orphan is now playing one of Daddy Warbucks's servants. And for another, the evil Miss Hannigan is portrayed by a transvestite by the name of Lily Savage. 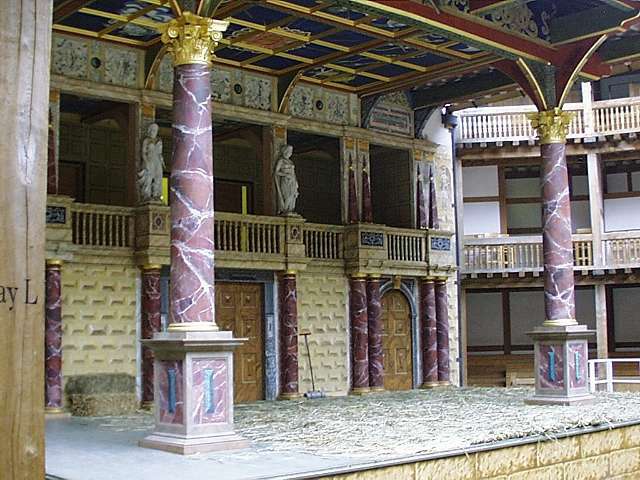 What, there aren't enough roles for men on the legitimate stage? 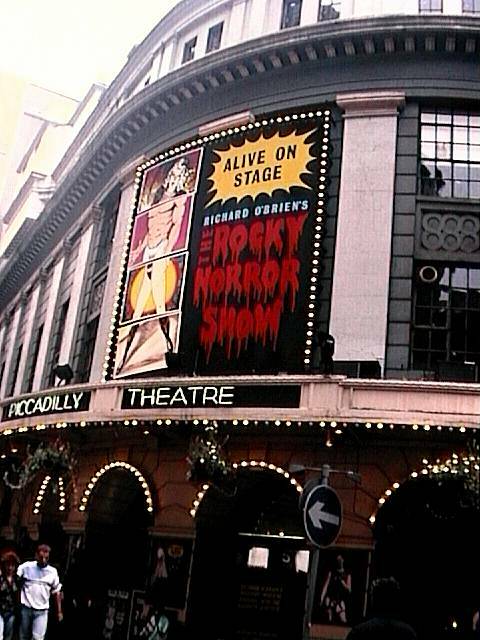 Speaking of transvestites, London is also where I saw The Rocky Horror Show five times, completing its original seven year run at the Comedy Theatre. This marquee is from a revival at the Picadilly which, although fun, just wasn't the same. And I could have done without the audience participation. I wish people would save that stuff for the movies. 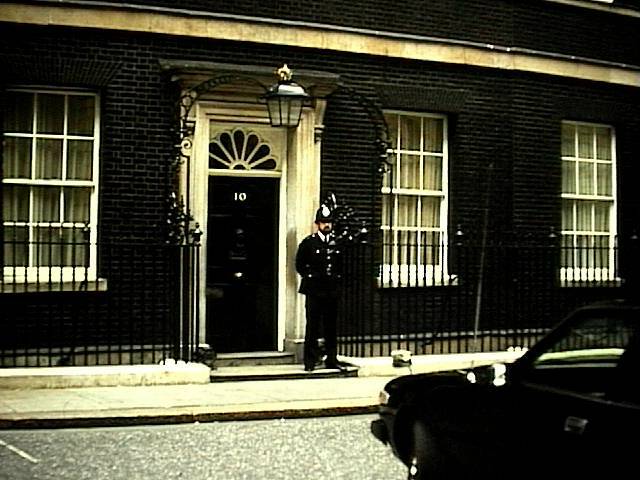 This unimpressive door belongs to Number 10, Downing Street, the Prime Minister's residence. Not exactly the White House, is it? To be fair, the doors to any of the Queen's homes are probably a lot more spectacular. I was lucky to get this shot on my first visit. Nowadays they don't let you get nearly this close. Something to do with people who have an extreme approach to expressing their political views. A little excursion to Dover, two hours by car from London. 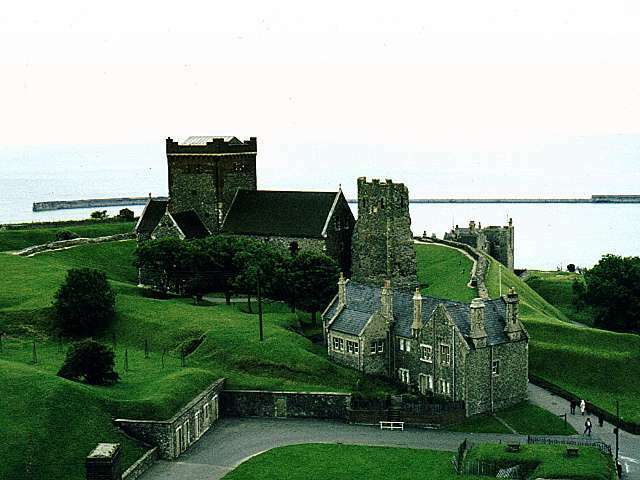 Famous for its White Cliffs, the Channel Tunnel (which was only a dream when I was there) and this little piece of architecture, Dover Castle. By the way, I finally got my chance to to take Eurostar through the tunnel on my way from Paris to London. What surprised me about the journey is how commonplace it all is. Just a pleasant little train ride that happens to be the culmination of a hundred year old dream.